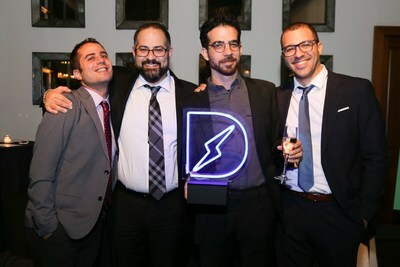 NEW YORK, Nov. 28, 2018 /PRNewswire/ -- Apester has been named "Best Interactive Content Platform" at the Digiday Technology Awards, the annual celebration of excellence and innovation in online media, publishing and advertising. Apester's massive growth as an interactive content platform has come from their partnerships with publishers such as Meredith, TI-Media, IDG Group, Penske Media, Virgin, ITV, and RTL. Users are able to easily create, distribute and monetize quizzes, polls and Instagram-like Stories across their properties without a graphic designer or developer. In addition to powering daily coverage of news, Apester has also partnered with online publishers to engage audiences with key editorial projects. For the third year in a row, Apester is powering TIME's Person of the Year reader's poll. The poll was published earlier this month using our flagship Story format. The results will be revealed in December, followed by TIME's editorial choice for the 2018 Person of the Year. Earlier this year, Apester's engaging interactive formats were also involved in projects such as the TIME 100 Most Influential People; EA and Bundesliga's Team of the Season partnership; Entertainment Weekly's Oscars bracket; the Trusted Reviews Awards 2018 and Germany's The Bachelorette reality show. Brands such as Ikea, Chase, Strauss, and ride-hailing app Gett, have adopted Apester's platform for their campaigns, creating engaging branded content to increase brand awareness and conversions. Apester is a plug-and-play platform for the creation and distribution of mobile-friendly, interactive content which improves commercial and editorial KPIs. Apester's content formats drive significant increases in editorial and commercial KPIs, such as 150% more time on page, 400% increases in interactions and social shares of content, and up to 25% increases in revenue per reader. Apester provides more than a billion content impressions and 500 million engagements each month.